"When I think about everything we've been through together, maybe it's not the destination that matters, maybe it's the journey." This one-liner belongs to Harry Kim, a character from the Star Trek Voyager show - probably the episode when they all realized the ultimate truth about how far Earth is from their location and that even the lifetime might be too short to reach it back. It was one great show I swallowed in just couple of weeks back then in the beginning of 21st century. I remember I was watching up to 6 episodes every night and now looking to it from today's perspective perhaps the most memorable line I still remember is this one about famous journey-destination quote. So, what is your ultimate answer? Is it Journey or Destination? For me there is no doubt, it is always the journey. Even for travels as small as 50km we do to escape city on weekends and go to the mountain village I mentioned couple of times before on the blog. I really can't say how many times I drove this 50km and back but let's assume I am doing it twice a month each year which results in about 96000km spent so far since my childhood. Couple of times I did it with mountain bike. That's amazing number - and it's twice the length of the Equator! Needless to say is that I know every little curve on that road, every little hole, asphalt defects and dangerous spots. All the scenery left and right, all the villages and traveling resorts positioned on the way. All the people we encountered over the years. And I never get bored by it. Every time it shows us something new, sometimes it is the hawk floating the hot air just couple of meters above, sometimes it is beautiful rainbow like the one we saw today on our way back home. Sometimes not so pretty scenes like floods or road kills. But that's life and one road like this particular one is definitely full of stories. By car in strait drive it takes about 45 minutes to get the destination. It's not that long trip and our last journey on Friday, with two stops took us exactly 59 and a half minutes. This was my second try to film the entire trip and this one is made with GoPro Hero 5, the latest edition of the famous action camera. The weather wasn't compelling and eye-catchy so the result passed several filters, both within video editing software and YouTube itself. It was more one of our first camera testing than the final film and while the road itself was currently going through the repayment process, I am sure there will be more timelapses of the same route in the future. But first recording attempt dated back in 2013. Back then, for a while I was having this idea to mount a tripod and take the video of the whole trip with old fashioned digital camera and I did it in second try. First time, the poor thing tried to auto focus all the time and somehow found convenient to focus on the windshield most of the time and instead of the road I got a video of dead insects glued to the glass. Nevertheless, when I matured enough, the following, also heavily filtered video was the result. From the technical point of view, the route is equally interesting. When I got my first smartphone I immediately tested it's GPS system on the road and the GPX file imported into Google Earth could give you interesting video animation in the result. 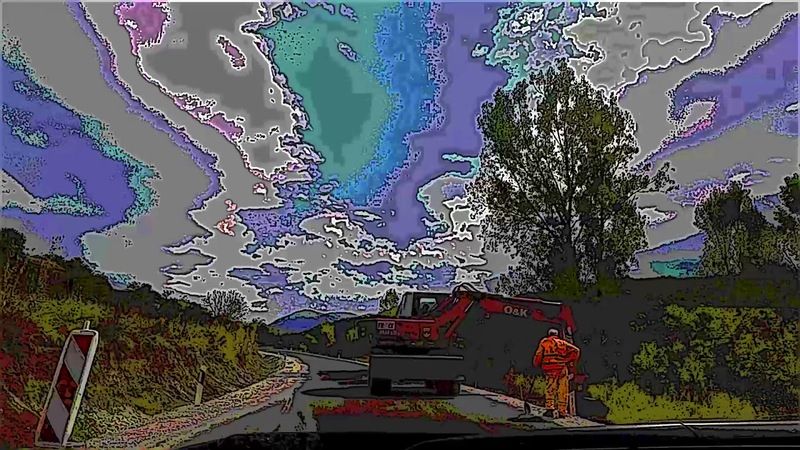 If you like to play with I have some instructions in post GPS eXchange files vs Tracking apps and also the above route is video caught in this YouTube video: Niš- Guševac, Short Route.